We all love Brixton Wholefoods. 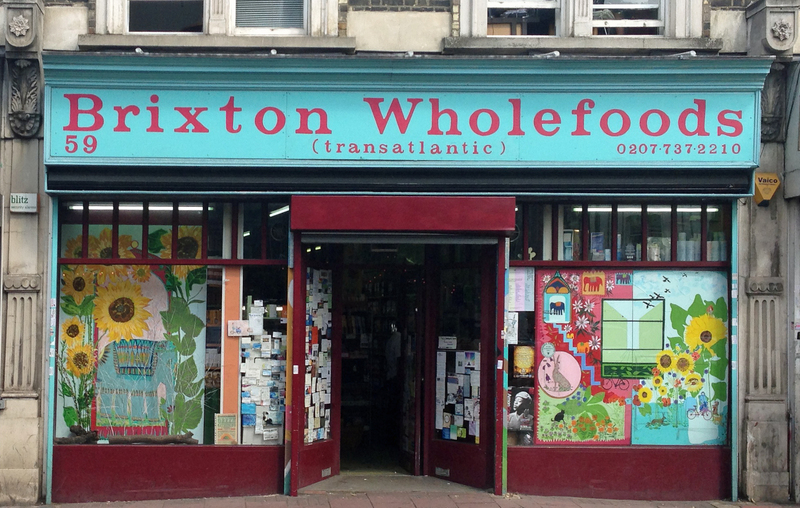 It’s a touchstone for long-term Brixtonites and, while we might not shop there all that often, we are glad it’s still there like a 1970’s time capsule. Which is a bit surprising as it didn’t open until 1982. It even stayed the same when moving across Atlantic Road from what was the site of the first David Greig’s grocery store and where the Lounge can now be found – hence the “Transatlantic” on the shop front. Idiosyncratic is the word to describe it. Unsurprisingly it sells whole foods as well as ecologically sound body care and household goods. But so does Tesco nowadays. 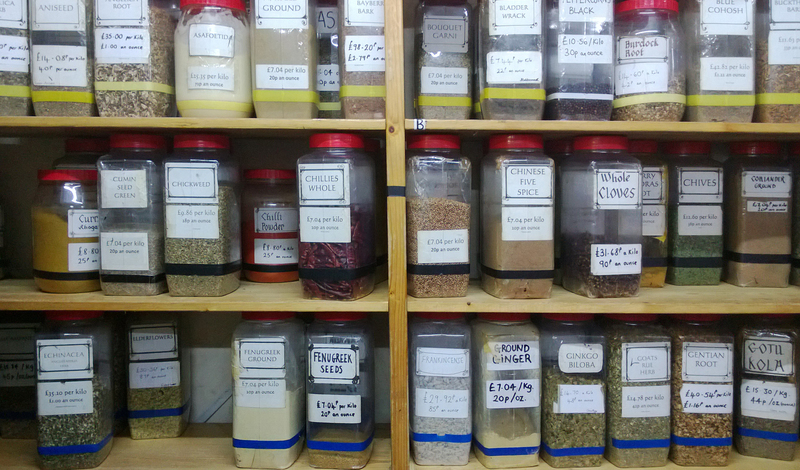 What makes it special is the earnest hippy atmosphere; the small ads in the windows for everything from alternative lifestyles to guitar lessons; the jars and jars of herbs, spices and goodness knows what, which you have to weigh yourself and write the price on the bag; the rather limited selection of organic fruit and veg. that looks worthy rather than appetising; the best selection of herbal teas it’s possible to imagine; the fact that their opening times are set to suit the staff rather than the customers; the recycled plastic bags; and, most of all, bags and bags of grains, pulses and whole wheat pasta . It’s not especially expensive, with prices averaging only about a third more than Tesco. That’s based on making my granola with like for like ingredients. And, not surprisingly, it’s strictly vegetarian. Not vegan thank goodness, as they sell milk, yogurt, eggs and a limited range of good quality cheese. Since the whole point of this part of the blog is to come up with a recipe, this rather limits things. So I’ve gone for a mushroom risotto. Not with the ‘fresh’ mushrooms, as they were looking a bit on the weary side. But they sell an excellent pack of dried “hand picked mixed forest mushrooms”. 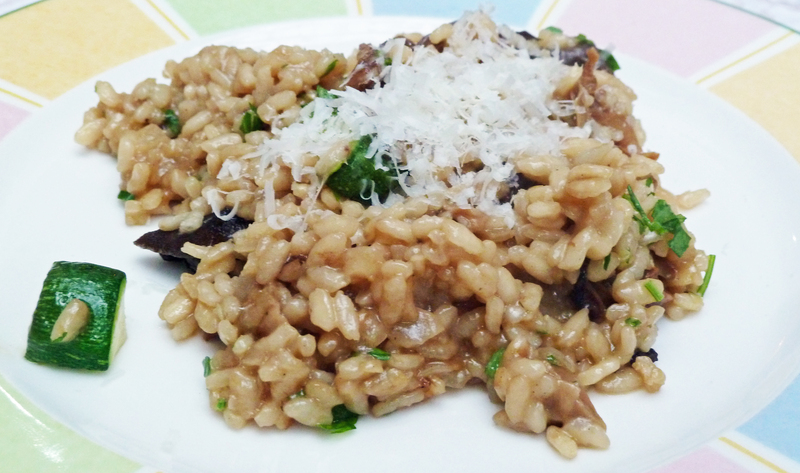 50g butter/ 25ml olive oil/ 25g dried mushrooms/ 1 onion chopped/ 1 clove of garlic/ 200g biona organic risotto rice/ vegetable stock powder/ fresh parsley/ 50g parmesan cheese. Nothing special about the recipe. Soak the mushrooms in boiled water for 15 minutes. Grate the parmesan cheese. Fry the onion, finely chopped parsley stems and garlic in the oil and butter until transparent. Squeeze the mushrooms dry, chop and add to the onions and fry for another couple of minutes. Add the stock powder to the mushroom water and make up to 500ml with more boiling water. Then start adding the stock to the rice, a bit at a time and keep on stirring. It’s the stirring that creates the creaminess of a good risotto. Keep on adding the stock, a ladle full at a time, until it’s all gone. The rice needs to be “al dente”, i.e. not entirely soft so it turns into mush. Use some more hot water if the stock is not enough. Then, when the rice is ready, season to taste, add half the cheese, stir, cover and leave for five minutes. Then serve with a sprinkling of chopped parsley leaves, with the rest of the cheese left for people to add themselves.